Purest Colloids offers you MesoSilver, a natural mineral supplement that improves overall health and wellbeing. Silver colloids have gained popularity in recent years as more and more people turn to natural forms of supplements and healing to improve their lives. With our products, you can be certain what you receive is safe and effective. 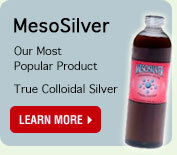 MesoSilver is a true colloidal silver, meaning is contains a majority of silver particles instead of silver ions. It has the highest particle surface area ever made for maximum effectiveness. It tastes like water to most people and those people have made numerous statements about improvements in their overall heath since they started implementing MesoSilver brand colloidal silver into their daily vitamin regime. For thousands of years, silver has been used around the world as a healing agent. Long before the use of modern pharmaceuticals, silver was employed as a germicide. It was known that disease-causing pathogens could not survive in the presence of silver so it was used in dishes and eating utensils. Doctors even used silver sutures in surgical wounds with very successful results back in the 1800’s. We have access to a state of the art laboratory where ongoing research and development are performed. Our scientists have over half a century of experience and work to continually improve our products including MesoSilver. We seek to keep our products at the forefront of quality, safety and effectiveness. That is why we test for quality and safety on a regular basis. Colloidal silver products are the most widely popular of all the metal colloid mineral supplements and we want to ensure that our silver colloids are of the best quality possible. What are you waiting for? Order your mineral supplements today and start down the road to a healthier and happier you. You will be glad you chose our quality products to help promote a healthier you and aid in your overall wellbeing. We know you will be satisfied with MesoSilver or we will give you a full refund. Contact us today to get started with our products.